District 1 – Sabetha has clinched the District 1 title and a seventh straight playoff appearance by beating Riverside and Horton. The winner between the Riverside and Horton game this week will advance to the 3A bracket as the runner-up. District 2 – Centralia has clinched a playoff spot, but can win the district championship by beating Rock Creek. The Panthers can also clinch the title by losing to Rock Creek by less than 19 points as long as Nemaha Central wins. Rock Creek is the district champion with a win and a Nemaha Central loss. Nemaha Central can get in by beating St. Marys and hoping for a Centralia win over Rock Creek. St. Marys is eliminated because even though the Bears could win and tie with Nemaha Central and Rock Creek, they could not finish with the highest district points tie breaker among those three teams. District 3 – All four teams still have a chance to make the playoffs under various scenarios. Maur Hill-Mount Academy can clinch a playoff berth for the first time in a long time with a win or a loss by less than 14 points. If McLouth and Atchison County win; McLouth would be the district champ. For Atchison County to get in, the Tigers must win by at least 15 points and hope for at least a 21-point loss by McLouth. District 4 – Rossville and Silver Lake have already qualified for the two playoff spots. The Bulldogs and Eagles will meet in Rossville in the next edition of the War on 24. Silver Lake remains No. 1 in the 3A rankings, while Rossville is No. 2. District 5 – Wellsville has clinched at least a playoff spot because even if the Eagles lose this week, they can finish no worse than second in the district points tie-breaker. The other three teams still have playoff hopes based on a number of different scenarios. District 6 – St. Mary’s Colgan has clinched the District 6 championship with wins over Northeast-Arma and Humboldt. The Vikings and the Cubs will meet this week in Humboldt to decide the district runner-up spot. District 7 – Eureka is the only team mathematically eliminated from District 7. The Tornados would have to beat Neodesha and hope for a Fredonia loss, but still could not finish with the most points in the tie-breaker among those three. Caney Valley can clinch the district title with a win or a loss by nine points or less. District 8 – After beginning the season ranked, Galena lost four of its first five games. The Bulldogs have won three straight and look like the contender they were believe to be. They’ll battle arch rival Riverton for the district title this week. Both Galena and the Rams have clinched playoff spots. District 9 – Chaparral will host Conway Springs for the District 9 championship game. The winner goes as the district champions, while the loser is the runner-up. District 10 – Wichita Collegiate has already clinched the district championship after beating Leon-Bluestem and Wichita Independent. The Bluestem Lions and Independent Panthers will square off this week in Leon to determine which team qualifies as the district runner-up. District 11 – All four teams still have a chance at the playoffs. It’s hard to believe the Hutchinson Trinity is 8-0 and still has a chance to be left out of the playoffs in District 11, but that’s the reality. If the Celtics lose to Halstead and Kingman beats Garden Plain, the two playoff spots will come down to the two teams with the most district points to break the three-way tie. Trinity could be out at 8-1. Of course, the Celtics could also win the district title by beating Halstead. Garden Plain can get in by beating Kingman by more than 17 points and Halstead loses to Trinity by 16 or more points. District 12 – Hesston will travel to Southeast of Saline to decide the district championship and both playoff spots. The winner is the district champion, while the loser qualifies as the runner-up. District 13 – Marysville is the only team eliminated thus far as even if the Bulldogs beat Riley County by 21 points they couldn’t overcome Minneapolis in the points tie-breaker should the Lions lose to Washington County. Washington County can clinch the district title with a win, while Minneapolis is the district champion if the Lions beat Washington County and Marysville upsets Riley County. If the Tigers, Lions, and Falcons finish in a three-way tie for first place at 2-1, the points tie-breaker will decide the two playoff teams. District 14 – Norton has already clinched the district championship after beating Russell and Beloit. The Beloit Trojans and Russell Broncos will play in Beloit with the winner qualifying as the district runner-up. 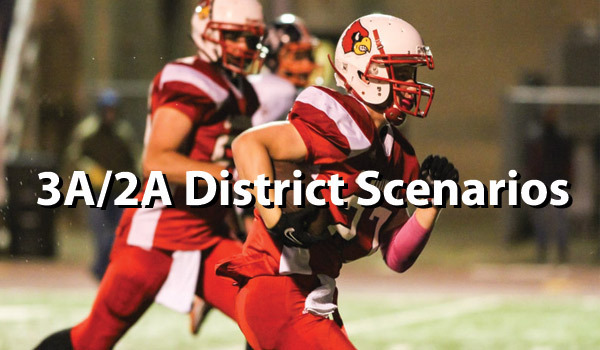 District 15 – All four teams are still alive, but Hoisington has secured a playoff spot. Even if the Cardinals lose to Lyons and Ellsworth beats Sterling, Hoisington would finish among the top two in district points. Sterling can also steal the runner-up spot by beating Ellsworth by at least 17 points and hoping for a lop-sided Lyons loss to Hoisington. District 16 – Scott City will host Cimarron for the district championship this week. The winner will qualify as the district champion, while the loser will be the runner-up. District 1 – Troy has clinched the district championship by virtue of wins over Jefferson County North and Doniphan West. The Week 9 match-up between the Chargers and Mustangs will decide the runner-up spot. District 2 – Onaga is already the district champion having finished their district schedule unbeaten at 4-0. Jackson Heights will travel to take on Valley Heights with the winner qualifying as the district runner-up. District 3 – Marion and Mission Valley are both 3-0 in district play. The Warriors and Vikings will meet this in Eskridge with the winner claiming the district title and the loser qualifying as the runner-up. District 4 – Olpe is the District 4 champion after starting 3-0 including wins over Lyndon and Whitewater-Remington. Remington travels to Lyndon this week with the winner qualifying as the district runner-up. District 5 – Sedgwick has qualified as the district champion and Sacred Heart is the runner-up. Sacred Heart has completed their district schedule and has an open date this week, while Sedgwick plays Moundridge. Should the Wildcats win all three teams would be tied in the district standings at 3-1; however, Sedgwick and Sacred Heart would qualify for the playoffs by virtue of the points tiebreaker. Even with a blowout loss to Moundridge, Sedgwick can finish no worse than +42 in points, while Sacred Heart finishes at +38 and Moundridge can finish no better than +25 points. Therefore, the Cardinals and Knights are in. District 6 – Phillipsburg hosts Smith Center this week and a Panther win would clinch the district title and make Ell-Saline the runner-up. A Smith Center win would secure a playoff spot for the Redmen even though it could throw the district into a three-way tie at 3-1 if Ell-Saline beats Republic County. If that’s the case, the top two finishers in district points would get the playoff spots, which means that Ell-Saline would need to at least win by 21 points and have Simth Center beat Phillipsburg by at least 12 points to secure a playoff spot. District 7 – Oakley and La Crosse have each qualified for the playoffs. The Plainsmen and Leopards will meet this week in Oakley to decide the district championship. District 8 – Elkhart is the district champion by virtue of a 27-26 win over Meade. Sublette can force a three-way tie in the standings with Syracuse and Meade by beating the Buffaloes this week. However, the points tie breaker would favor Meade as the Buffs could finish no worse than +20, while Sublette cannot finish better than -2. Syracuse has completed their district schedule and is at -19.